I aim to make my KS1 workshops fun, captivating, all-inclusive and inspiring. I like to start by introducing myself and talking with the children about the different books they know and love. Then I read them one of my own stories, using a big screen projector and animated images to ensure that they can see the beautifully detailed illustrations. My workshops then show the children how they can use their imaginations to come up with bigger, better ideas, and to build their vocabulary so they can fill their stories with inventive and interesting words! JUNKYARD CREATIONS WITH “SPACE TORTOISE”! 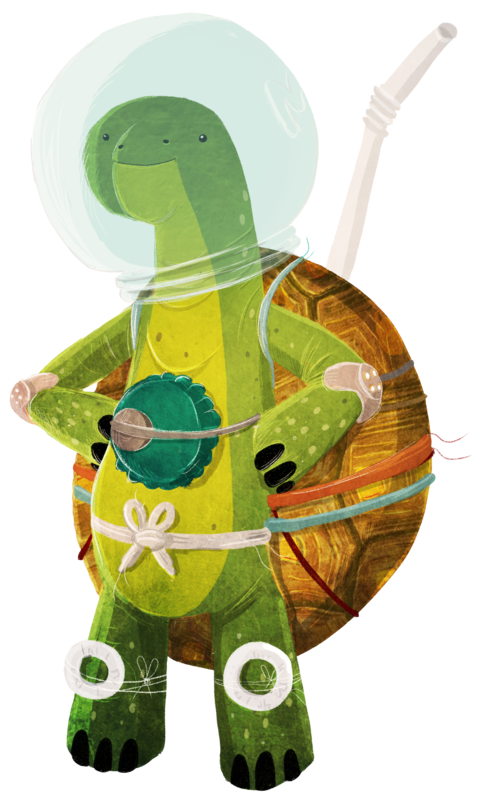 In SPACE TORTOISE, a lonely tortoise tries to reach the stars using the items he finds in the bin – everything from a spacesuit to a hot air balloon. In this event, we think about other items that the tortoise could have made from discarded objects in the park: a hangglider from newspaper and dental floss? A car made from burger boxes, with onion ring wheels? The only limit is your imagination! CREATE CHARACTERS WITH “THE BUILDING BOY”! In my picture book THE BUILDING BOY, a young boy creates a giant version of his architect grandmother out of bricks, glass and girders… which comes to life and takes him on a magical adventure! Inspired by the story, each child designs their very own unique character from different objects – anything from vehicles to vegetables! As well as labelling each part, children are encouraged to include adjectives or even alliteration in their designs, stretching their imaginations and vocabulary. It can be hard to start a story – what should it be about? Who’s the main character? What happens in the end? In this specially tailored workshop, I’ll work with your KS1 class or year group to create the framework for a story which they can continue to work on after I leave – ideal for a termly writing topic. Whether your focus is creating characters, structuring stories, or writing a tale set in Victorian times, I’ll put together all the ingredients with your class to help them get excited about writing and release their inner author! Suitable as a talk or workshop for Years 1 and 2. Want a different kind of event? Want more info? Please CONTACT ME and get in touch!